No, there's no surf here. Just three electro-industrial instros amid a wash of stark vocals, including their most amazing psychedelic cover of "Ring Of Fire" (Johnny Cash). But, amidst the psycho warbles is a very cool futuristic vision of spaghetti western civilization. Digital pasta for the diner. "Struggle" pits dirge keyboards against Casio percussion like rain dripping in a down spout, and relentless state of repetition, punctuated by water bubbling and orgasmotronic moaning. Interesting once. This short burst of whirring noise leaves much to be desired, like a song maybe. 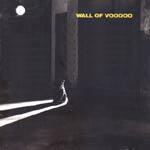 Referring to these two spaghetti western epics as "a little fill music for ya," Wall Of Voodoo industrialize Enio Morricone is a bizarre manner. The guitar is growly and grodie, while the Casio percussion makes the songs surreal. The synth carries the whistling warble. All in all, a pretty interesting interpretation that retains the spirit of the tunes while completely reinventing them.